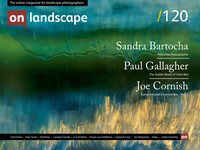 Landscape photographer based in the North East of Scotland with a leaning towards intimate landscapes. Retired designer. Clashach Cove, sometimes known as Cove Bay, is in the North East of Scotland and is situated on the Moray coast to the East of the little town of Hopeman. It is a location close to my home in Lossiemouth and only a ten-minute drive away by car. My photography in the location has developed into a personal project. It's hard to believe that it was about forty-five years ago when I was first introduced to Clashach Cove. Two school friends and I had left school 'early', if you follow my meaning, and had driven down from Elgin on a warm early summer afternoon. The year was 1970, and we huddled precariously beneath a sandstone overhang fairly high up on the sandstone cliff which forms the Western edge of the cove and there read J R R Tolkien's Lord Of The Rings. A magical book in a magical location! To us humans forty odd years may seem like a long time ago but it's not until one realises that the 'Old Red Sandstone' found in the area was formed around 360 to 415 million years ago and that the relatively young 'New Red Sandstone' in this area was formed a mere 200 to 300 million years ago that our notion of what a 'long time' pales into insignificance! Following that first introduction, I visited the cove on countless occasions, but it wasn't until around eight years ago, when I first looked at it and the surrounding area with photography in mind, that my idea for the project was formed. The location is of interest to geologists, and it is not unusual to observe groups of university undergraduates on field trips to the area. I am not a geologist, but I do find the geology of the area fascinating, and indeed it was the geology which took my interest in the first place. The 'Cove' itself is roughly 120m wide and, from the high tide mark, stretches back inland for about 100m. Slightly to the West lies a smaller area known as Prieshach Cove. Above the cliffs at Clashach and very slightly to the East lies Clashach Quarry where sandstone has been extracted for building use since the early 1800s. Above the cliffs at Clashach and very slightly to the East lies Clashach Quarry where sandstone has been extracted for building use since the early 1800s. The sandstone has more recently been used in the construction of the National Museum of Scotland in Edinburgh, the extension to the National Gallery in Edinburgh, the 9/11 memorial in New York, Barcelona Cathedral and in the ongoing construction of Antoni Gaudi's La Sagrada Familia in Barcelona. Landscape photographers are drawn to the cove and nearby areas and over the years I've had the pleasure of meeting some of them. Neil Gove, Douglas Griffin and Grant Willoughby spring to mind and of course Ian Cameron who, certainly, in my opinion, has made some of his best photographs in and around the area. Joe Cornish has also made photographs at Clashach which he included in ‘Scotland’s Coast – A Photographer’s Journey’ (Pages 138 – 141) and Paul Wakefield told me only recently that, although he hasn't been there for a while, it is a location that he likes visiting. My project is predominately centred in a small area which is sheltered from the sun by a high North facing sandstone overhang located on the Eastern boundary of the 'Cove' and accessed during periods of low tide via a natural arch which leads under a large geological fault. The overhang excludes the sun for most of the year and so, apart from during the sunsets and dawns of mid-Summer, I mostly work in reflected light when I explore the relationships between that light, the smaller round stones, larger sandstone rocks and walls, rock pools and the algae patterns and the colours found in that area. The smaller round stones grind smooth patterns into the base rock and these, in turn, provide holding areas for those same different coloured stones. The area changes with every tide, sometimes quite dramatically, bringing new compositions to explore. The smaller round stones grind smooth patterns into the base rock and these, in turn, provide holding areas for those same different coloured stones. The area changes with every tide, sometimes quite dramatically, bringing new compositions to explore. Sandbanks come and go filling small caves and covering rocks. Kelp arrives one week and has gone the next. Algae patterns intensify or die back at different times of the year. Fulmars nest in higher cliff ledges and the sound of the sea is always there and always changing. It's a dynamic little area where everything changes but at a different rate with some changes taking place in hours and some changes taking many millions of years. Some 250 million years ago the 'new red sandstone' formed part of a desert dune structure and dinosaur footprints and tail drags were revealed in the quarrying process mentioned above. My project examines a tiny and minuscule slice of time really, something which is so very obvious to me both when I'm writing this and when I'm standing there. For the project, I tend to concentrate mostly on an intimate landscape approach and try to restrict myself to a 24mm focal length. I never use my polarising filter preferring to photograph the light and colours as they are and I use a tripod mounted Nikon D800 with a cable release. Images are processed in Lightroom and Photoshop, and I sometimes use a ColorChecker Passport target on-site. This then allows me to build custom DNG camera profiles in Lightroom via a plug-in. I also sometimes make 'wider' photographs in the most general area of the location during those periods when maybe the light is harsher and when the contrast becomes too great or when the tides prevent access to the location. Of course,, I also visit other locations, and I find it beneficial to move inland and away from the coast sometimes to get another perspective on the landscape. I also try to get over to the North or West of Scotland on at least a couple of occasions per year for a complete change, and I'm already looking forward to another Poolewe based visit planned for late November. I've also recently started to explore the vastness of Culbin Forest which has a different beauty and equally interesting history. I'll always have a special interest in Clashach however. It is a special place. I would like to thank George G Meldrum BSc, MSc, Honorary Fellow of the School Of Geosciences, the University of Edinburgh, not only for his knowledgeable input about the geology of Clashach but also for his friendship and encouragement of the project. The project is on-going, and I update the set on my website regularly. Do you have a project, trip report or location that you would like to submit an article on to On Landscape? We'd love to hear from you! Please submit our submissions form and we will get in touch.